This unusual double finger signet ring combines elements crafted during both the late eighteenth and late nineteenth centuries, while also incorporating various, more ancient, historical sources in terms of form, materials and decoration. Yet one theme unites each of these components: an association with the Near East, a region which stretched from Egypt to India, and from northern Turkey to the tip of the Arabian Peninsula, all of which was ultimately united by the Islamic religion. The forma fixed double shankis a type which appears to have originated in the ancient Roman Empire, based on a number of extant examples in the British Museum, each also horizontally mounted with three gemstones. At least two of these examples were unearthed by the famous French collector Louis de Clerq (1836-1901) while working as a photographer on a Ministry of Public Instruction expedition in Syria, which was part of the Roman Empire at the time of the manufacture of these rings. They are now thought to have been used for funerary purposes. Further to the form, engraved signets have their origins in the heart of this part of the world. The first wearable seals, engraved on cylindrical beads, were used by the ancient Sumerians of Mesopotamia, or present-day Iraq, as early as 5000 BC. Set in rings by the ancient Egyptians, the use of signets continued throughout this region, perhaps the most notable example being that of the Islamic prophet Mohammed (c. 570-632 AD), who is recorded as wearing a silver and hardstone signet engraved 'Mohammed rasûl Allah', meaning 'Mohammed the Apostle of God'. According to Jean-BaptisteTavernier (1605-1689 AD), French pioneer of the gem trade between East and West, the sultans of the Ottoman Empire wore signets engraved with their names. Seal rings with Arabic inscriptions continued to be worn into the nineteenth century, eventually becoming fashionable in Europe and America. George Frederick Kunz (1856-1932), prominent jewellery and mineral scholar and Chief Gemmologist at Tiffany & Co., is known to have worn a signet ring inscribed with his name in Arabic, made for him in Tehran in 1895. The gemstones set in this ring also relate directly to the Near East. The emerald is engraved with the words 'Salam Allah' in Arabic script, meaning 'Peace to Allah', and with the Arabic date 1211, or 1790 in the Western calendar. The tradition of engraving emeralds with Arabic inscriptions first emerged in the western Indian subcontinent during the Mogul Empire (1526-1857 AD). These successive courts obtained some of the largest and most important emeralds ever discovered, primarily from Columbia, and engraved the stones with Islamic prayers, perhaps the most famous being the aptly named "Mogul Emerald" carved in 1695 and weighing 217.80 carats. Inscriptions of this type, conveniently for scholars, traditionally include a date. 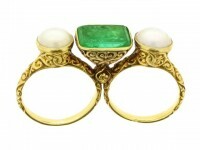 The pearls in this ring are too a link to this same geographic and religious background, specifically the Persian Gulf. This body of water was the preeminent historical source for pearls, with the earliest recorded pearling undertaken in the third millennium BC by the aforementioned Sumerians. Pliny the Elder (23-79 AD), Roman historian and naturalist, in his Natural History, remarked that the finest pearls in the world came from the Persian Gulf. The Gulf pearl industry thrived until the early twentieth century, its demise brought about by both the invention of cultured pearls and the discovery of oil. Created nearly a century after the carved emerald, the ring mount is decorated in the 'Saracenic' style, completing the intertwined geographic and religious theme. 'Saracenic' was a nineteenth century term which encompassed the various decorative styles of the Islamic cultures of the Middle East and North Africa, though its root---'Saracen'---was the Ancient Roman name applied specifically to the pre-Islamic nomadic people of the Syrian-Arabian desserts. During the late nineteenth century Western art and design was largely dominated by a fascination with the East, which included, in addition to the Middle East and India, China and Japan. One derivation of this Orientalism was the Saracenic style, characterized by dense symmetrical patterns of stylized foliate forms found in the medieval architecture and decorative arts of the Eastern Mediterranean. This particular pattern, with its symmetrical stylized foliate scrollwork, is highly similar to decoration found on a carved wood panel in the collection of the Victoria and Albert Museum in London, once part of the pulpit of a mosque in Cairo, made in 1296. The panel was exhibited in the museum upon its purchase, as well as at the Exposition Universelle in Paris in 1878, in addition to being published in Art of the Saracens in Egypt (1886) by Stanley Lane-Poole. Such exhibitions and publications are known to have been used as sources of inspiration for designers, including those working in the jewellery industry. It is clear that the designer took great care in the conception of this ring, made possible by exposure to a number of important collections and resources allowing for highly specific historical references, the compilation of which unite in this tour de force of the Saracenic style. The complex interplay of these decorative elements, along with the rarity of form and quality of both materials and manufacture, make this ring a highly important example of late nineteenth century Orientalist design. George Frederick Kunz, Rings for the Finger, New York: Dover Publications Inc., 1917.